We offer full service plumbing to all of our commercial customers. We have made a name for ourselves by offering our services over the whole state of Georgia as well as parts of Tennessee, Alabama, and South Carolina. We offer a 90 minute Emergency Response Time Guarantee to anywhere in Georgia that lies north of Macon. We pride ourselves on always being there when you need us, no matter what time day or night. We perform top notch service at a reasonable rate so if you choose Royal Flush, you’ll never need another plumber. 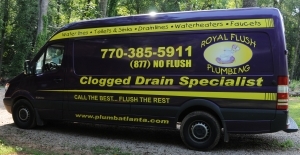 Royal Flush Plumbing….One Call That’s All!